Heard anyone have a good word for Levels these days? Sub-levels?…..anyone? There was a time when we embraced National Curriculum Level Descriptions as the welcomed solution. How quickly attraction fades. Or forgetful of what they replaced. Whilst many despair of what NC levels have become, they were not intended for use in the way they have now been evicerated, gutted and sliced. The first version of the NC introduced in 1989 in the core subjects had multiple Statements of Attainment in addition to Programmes of Study. Whilst the latter covered content, the former defined what a pupil should be able to do or know in all those areas of content. It was also a 10 level scale, envisaging a descriptor ladder that would reach to encompass recently-introduced GCSEs. In its attempt to encapsulate the essence of the subject Science had a bewildering 17 Statements of Attainment covering everything from ‘Genetics and Evolution (AT4), through AT9 (Earth and atmosphere) to Sound and Music (AT14) and beyond. Each of these had multiple elements (AT1 a-i in Geography) that required their own statements on the 10 level scale. For secondary teachers it was a bewildering array of tick-boxes to maintain track of for each pupil; for primary teachers it became an unwieldy colossus with up to 966 points of assessment to conjure with, for each child, across all the core and foundation subjects. But….and it’s an important ‘but’, this is what a ‘sophisticated’ attempt to profile student progress can look like across a spectrum of attributes of a subject. I can remember sitting at school with the Geography ATs (of which there were just a mere 7 planned – but which spawned pages of different statements of expected performance at various NC levels), cutting them up into individual paper strips and trying to recombine them into clusters that would allow us to teach a topic with some form of coherence that enabled us to tick off a bundle of ATs. David Bowie – you had it easy with a few lyrics; you weren’t even trying. Within two years the wheels were falling off the massively overladen wagon. By 1991 Science ATs were reduced from 17 to 4 and by 1994 Sir Ron Dearing was called in to carry out an overhaul of the still-young, but unloved National Curriculum. It was his review that resulted in the abandonment of Statements of Attainment as the definers of progress, and the introduction of Level Descriptions as a simplified, one-stop, broad-based, best-fit measure of what a student had achieved by 7, 11 and 14. The programme was no longer to embrace Key Stage 4, but finish at the end of KS3 with a consequent reduction in NC levels from 10 to 8 (plus an ‘Exceptional Performance’ option). 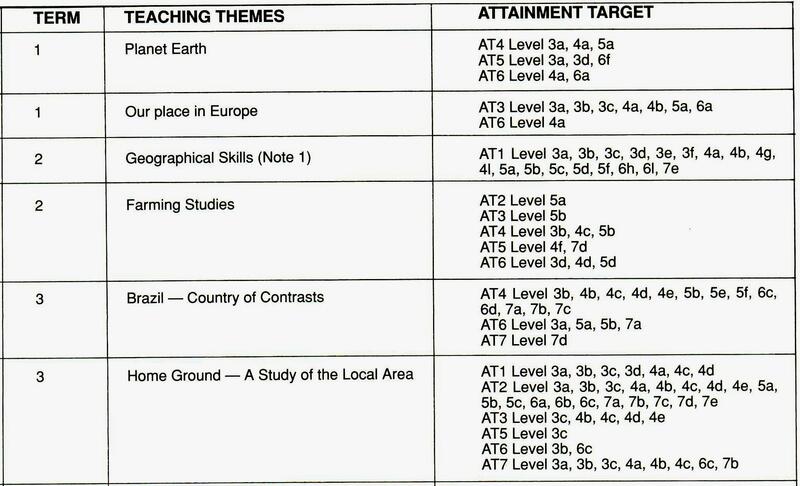 The important stress was that the new Level Descriptions were summative paragraphs to be used at the end of Key stages – and weren’t (indeed ‘couldn’t’) be used at interim points within a key stage, year, topic or individual piece of work. And that’s how it was. We were OK with this – a much more straightforward system that some subjects effected as end of key stage tests (SATs in English, Maths and Science) and the foundation subjects utilized with Teacher Assessment. We reported at the end of the Key stage, and only then. So when did it change? When did we start applying it mid key stage? When did we start making up sub-levels? And, more importantly, why? I remember holding out with SLT for two or three years. The pressure to provide NC levels in annual reports to parents at the end of Y7 and 8 was the start. I quoted Ofsted documents, Geographical Association articles about Level descriptors being intended solely as an end of key stage summary and for a while it was only the Core subjects that succumbed. They, after all, were subject to formal, externally marked SATs at the end of Year 9, so an argument could be made for students to sit ‘practice’ papers at the end of Y7 and 8. ‘Just to get them ready’. And then two developments occurred. Ofsted wanted to know not just about attainment at the end of key stages, but ‘progress’ throughout them. And data-collection packages were appearing on our screens. 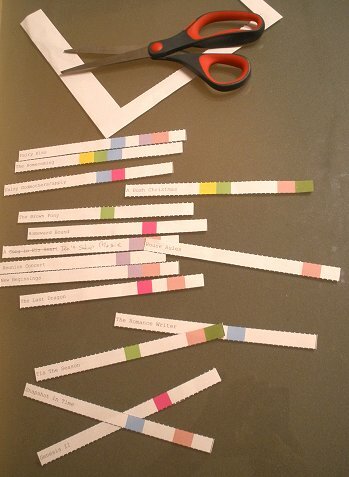 Slick, swift, manipulable, graph-producing, trend-divining – as long as you insert just one numerical value each time. SIMS – you have a lot to answer for. 1. This does not indicate that your child is less intelligent, lazier or more switched off now. 2. Neither does it indicate that I am not doing my job properly and don’t know what I’m doing. 3. It may indicate that this assessment was exploring a very different aspect of the subject compared with the previous one – this is highly likely. 4. It may indicate the different level of support and guidance given with a closely structured framework making it well nigh impossible for him to have demonstrated anything other than a level 6 in his previous performance, which I had largely removed for the latest assessment in recognition of his need to become more independent. 5. It may indicate that the school that your child arrived from and awarded the Level 6c, has a completely different interpretation of what a 6c involves than we do here. There is no moderation on these definitions between schools. 6. It may indicate that the previous teacher was coming to the end of the year and their Performance Management discussion was approaching that would determine their Performance Related pay. I’m not saying they manipulated the result – but maybe they were, shall we say, generous in their interpretation of the criteria. 7. It may indicate nothing more than the mood I was in when I marked that latest assessment and had I come to it 24 hours later I might have divined more subtle whispers of insight and understanding. This happens. 8. In fact, if I gave your child a level based on what he says in class it would be considerably higher than the one derived from writing on paper. And equally representative of the level he is thinking at. Maybe even more so. 9. I will, at parents’ evening, be able to give you a far more fully rounded summary of where your child is operating within this subject in all the varied, rich and sophisticated dimensions we explore throughout the year. It will take some time but I know your child inside out; I have marked his work regularly, talked and questioned, probed and challenged and set pathways for his thinking that, when he comes back with certain insights, astound me. Like the most awkwardly-shaped Christmas present you have ever presented – these cannot be wrapped up in a number and a letter. 10. Oh…by the way… a Level 6 in one subject bears little resemblance to a Level 6 in another subject. Yes – a level 6 is easier to achieve in some subjects than in others. Different groups of people writing the initial Level Description summaries, you see. Just thought you should know. 11. And please…..please refrain in the coming weeks, from asking the most inane question that some people tend to wander into a classroom and ask teenagers at random about their performance: “What level are you at now, and what do you need to do to improve?”. I have heard this asked before and my response is this: if a 13 year old can hold in their head their current National Curriculum level for all 13 subjects they study, and chant the things they must do to improve – which will be different for every subject, and that changes from term to term as their progress alters them – then there is only one level they can possibly be at; and that is ‘Exceptional Performance’ – and there is no more I can do for them. They have the memory of a sage. I don’t see the imperative for measures of progress at KS3 subsiding. Nor, indeed, should it. But we have a bargain-basement model at the moment. The quick, cheap ‘n cheerful, superficial spreadsheet of sub-levels masquerading as if it tells us something of worth, when all it is, is a veneer of showmanship. Let’s have something to show Ofsted. Let’s draw the line-graphs of progress against targets. Let’s not worry too much about the quality of the data, look at the width of our analysis of it. I want something more honest, more robust, more authentic to represent what students are achieving and teachers are accomplishing. There has to be a goldilocks position. Not the over-burdensome multiplicity of Statements of Attainment, but neither the crudity of what we have now. We need to go back to what all the marking, the assessment, the discussion of progress is about and refocus them all on where it matters. Ofsted has made it about the teacher, the department, the school. Is (s)he/ they / it… doing a proper job? Are they pushing the students enough? Do they have high enough expectations? Do we have the evidence? That’s what sub-levels were introduced for. I will happily be accountable – that’s not the issue. But I draw the line at having my accountability impact negatively on students because of the butchered version of assessment that seeped out from a system need, not a student one. I don’t have the answer, but I am convinced that now is the right time to open the debate. A new national curriculum is on the horizon and the attention has, so far, been on content. The assessment is still up for discussion. That’s what we need to have in robust terms of what progress looks like in each of our subjects. What do we want students to be able to evidence, and how, to demonstrate progression in English, Science, History, PE…. I still have really valuable discussions with students before they do the next assessment on what the criteria are for this one – and they are up for that. One of the few benefits of having to dream up sub-levels was the debate it provoked in our department about what ‘progression’ in geography is all about from a low level 6 to a high level 6 given that we had nothing to go on besides our own exploration of the very meaning of our subject. It is absolutely fundamental that each teacher carries a profound understanding of progression within their subject in their head if rich questioning, differentiation, focus on sequential learning steps, astute feedback and establishing criteria for assessment are to be of the highest quality. It is what underpins everything else. There is a place for criticism, but I prefer to be able to offer a way forward. I think the pendulum needs to swing back a tad; we should aim to profile students. A realistic, manageable but constructive mapping of where each student is on various attributes. My post on 3D SOLO is a starting point for my own thinking. I don’t think that’s it – it needs to go beyond this, but it strikes me that unless we diagnose where students are at on a variety of criteria, we will never adequately confirm to them their particular strengths, nor have the precision to advise where to focus their energies to make the biggest impact upon their progression. Subtlety with guile; though it will bear a cost. It doesn’t meet the needs of simple spreadsheets; it doesn’t give Ofsted slick answers; but it does provide for rich dialogue with students, parents, intervention teams and the teacher that the student moves on to next. It’s what will make differences.